I switched my geeky Galaga ring tone back to a standard ring (Nokia’s “bee”) the other day, when I finally came to accept I just couldn’t hear the Galaga tone outdoors. Also it appears my model of phone can’t handle starting quietly and getting louder with an MP3 tone. Who buys this crap? Who would actually want that as a ring tone, unless they want to flag to everyone around them that they’re a complete moron? And more importantly, do the people that buy this crap know what they’re getting themselves into? Read the small print. You’re not just burning good money getting a crap ring tone, you’re actually signing yourself up to their ringtone “club”, which costs you $9 every week, plus another $3 for each other moronic sound/ringtone you grab. How is this not a complete ripoff? Why on earth would anybody agree to this? Why are they even allowed to advertise this stuff? There’s little difference between it and an out-and-out scam. Stupidity tax, I guess. This ring tone add annoys me too. It may get its user into abit of trouble if it rings in places like airports. i have “shes a rainbow” by the rolling stones on as mine … love it and havent been able to persuade myself to change it since i put it on about a year ago! I have the Red Dwarf end credits theme tune complete with a couple of seconds of laughter. Scares the life out of people at first. 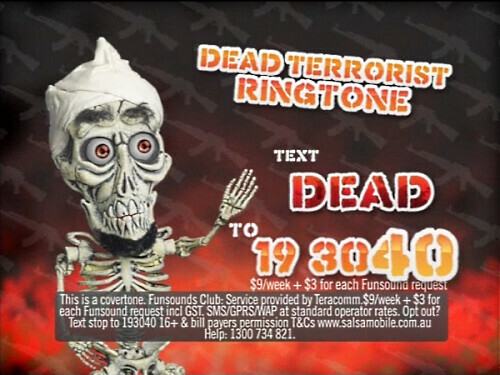 Well, Ahkmed the dead terrorist is a little bit funny, but not as a ring tone. Only downfall is if it rings if you’re on a tram! By the way, interesting fact for you today, Daniel. The 7.25am Werribee-City train was cancelled due to problems with trains on the Pakenham line. Figure that one out. I kid you not, this was the reason they gave. Yeah I can see it might be amusing, though not in the context of a ring tone. Ren, problems in Pakenham affecting Werribee might be the subject of a forthcoming blog post. There is no accounting for ones taste, I’ve guessed. Based on trying to call your kid “a number?” Based on wanting to change your name to Adolf Hitler? Based on wanting to join some bizarro website about necrophilia. We have that in the United Kingdom – they charge you £5 per week, plus £3 for every ringtone. I also heard a huge blast from the past – World 1-1 from the original Super Mario Bros (the person with the ringtone looked like he was 19/20 – younger than the game). Ah, thanks Scott. This pointed me to the original, which is pretty funny. With regard to scams involving mobile phones, late night on cable they have some shokers asking people to subscribe to “find out where your boyfriend is”, and who he’s with, and “text in your name and your partners name” and we’ll tell you if your compatible, these seem to be aimed at young girls and if their anything like my niece I can see why. They seem to prey on the most stupid in our comunity. I feel like I’m living in a society that’s half asleep :-( very sad.